Earlier, We shared a rather strange clip of a pastor using soft drinks such as coke and fanta to ‘anoint’ his church members. Yet another pastor has taken it up a notch and shown that even more outrageous miracle procedures can be carried out. 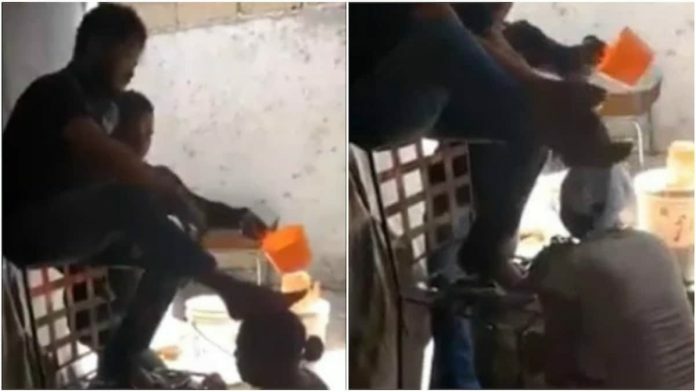 In a recently released video clip which has now gone viral, a pastor who is yet-to-be identified can be seen washing his face and feet with water on top of his church members’ heads. Many of them were seen queuing up for the anointing session which has sparked outrage on social media. In what appears to be a completely ridiculous session, many Nigerians have reacted to the clip on social media and most of them have blamed religion for misleading many who appear to be gullible and fall under the antics of self-proclaimed pastors. Na who do us this strong thing? I don't know why some people have refused to upgrade their cerebral capacity. Religion is inflicting damages to our confidence and faith and has completely reduced some adults to cretins.